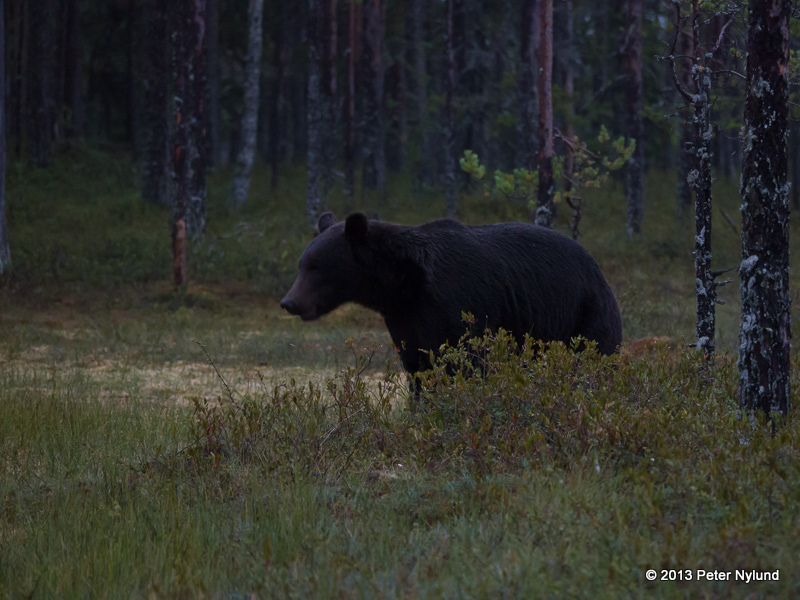 There are bears in the forests I visit, but I've never had the opportunity to see one. 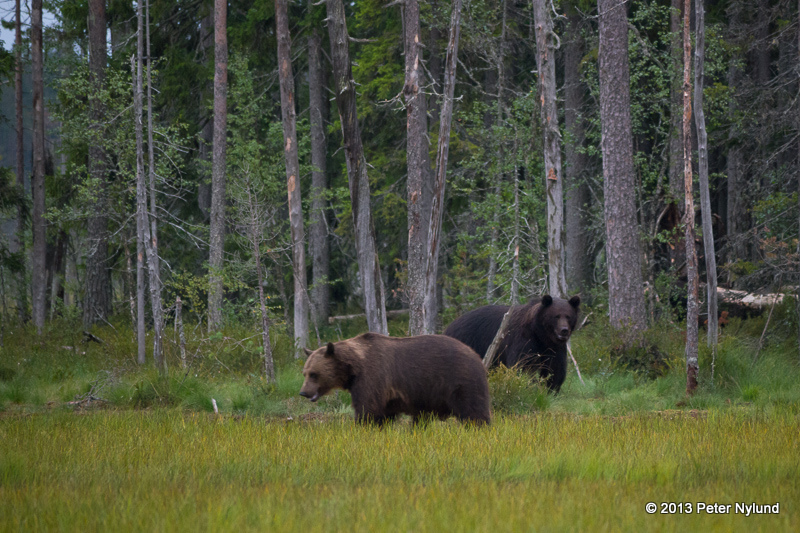 Due to hunting, which still is performed under strict control, the bears are very wary of humans and disappear before you have a chance to see them. 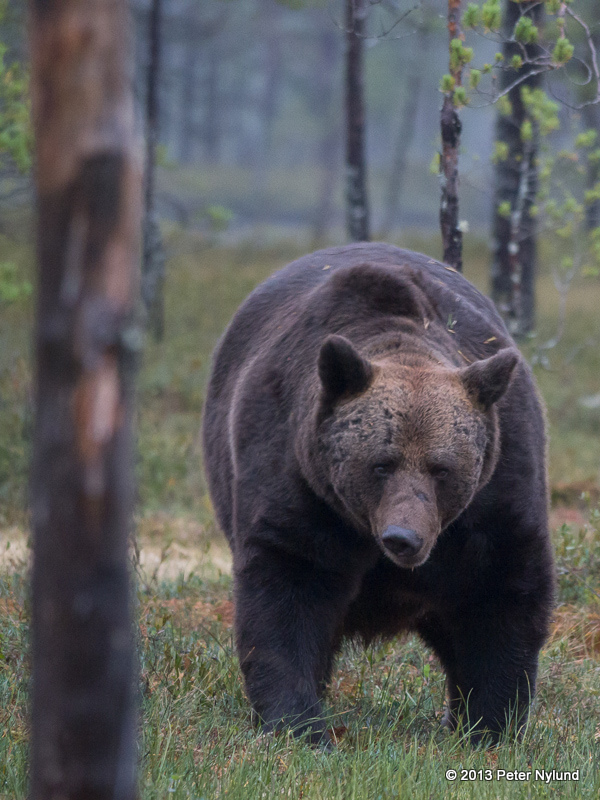 This behaviour also means that bears pose very little threat to humans, and there has been only one fatality, a jogger coming between the cubs and the mother, for a long time. 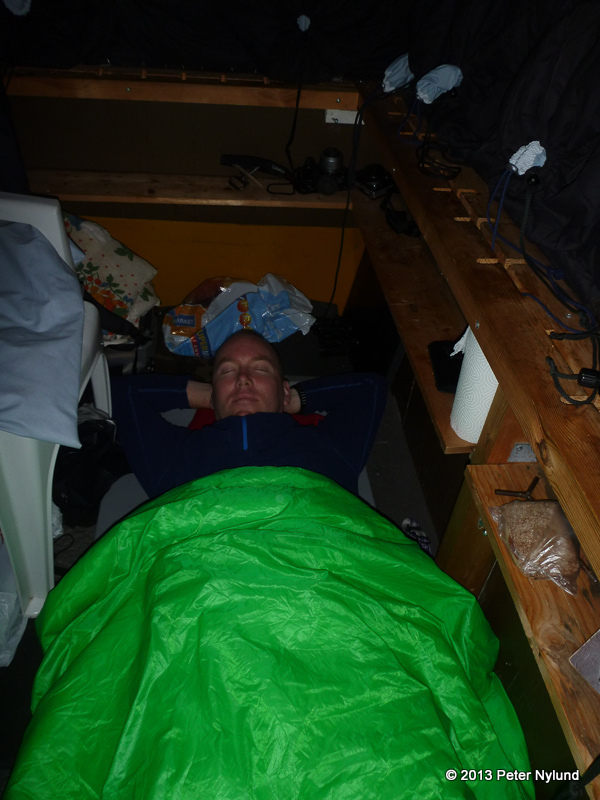 You don't have to take care to store your food or eat in another place than you sleep, like you have to do in America. 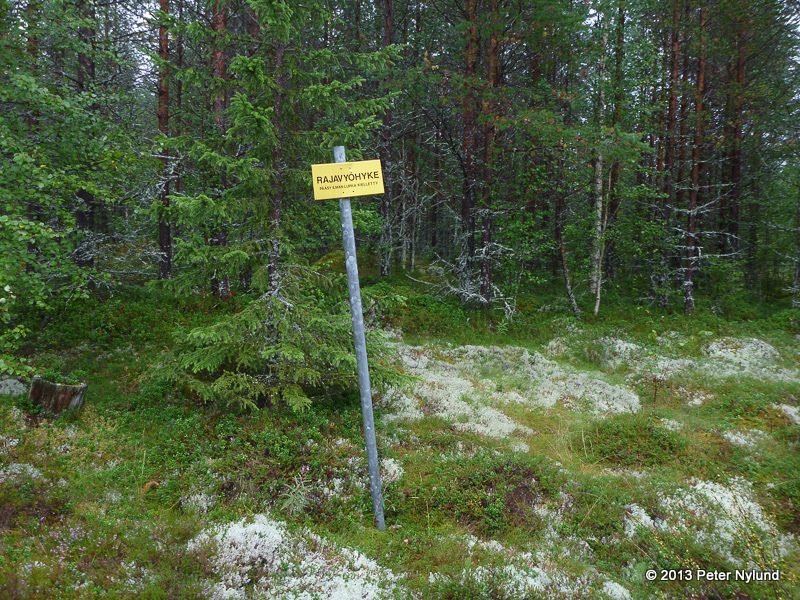 But this means that it is difficult to see bears, unless you use some tricks. 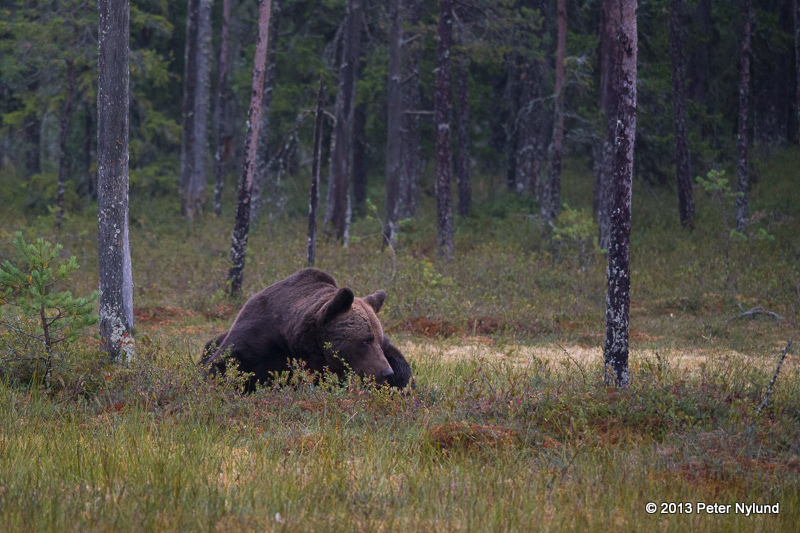 Lassi Rautianen, see www.articmedia.fi, is one of the foremost animal photographers in Finland and is also a nature tourism pioneer. 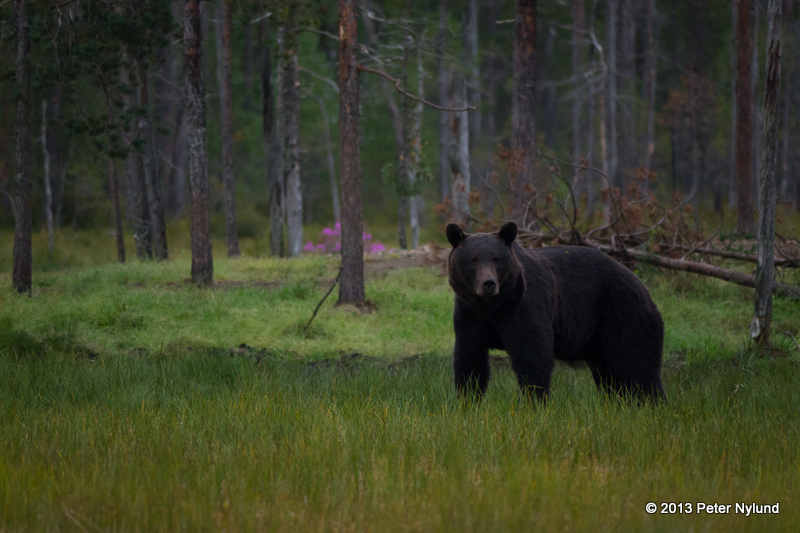 For twenty years he has had hides in the no man's land (requiring special permits to enter) along the Russian border, luring bears and other animals with carcasses to come before the hides for photography and filming. In the beginning only nature photographers and filmers were coming (BBC has lots of material from Lassi's hides), but later he started offering the services for a (slightly) broader audience as well. I went there with a small group of nature enthusiasts, with whom I've made a number of nature trips. 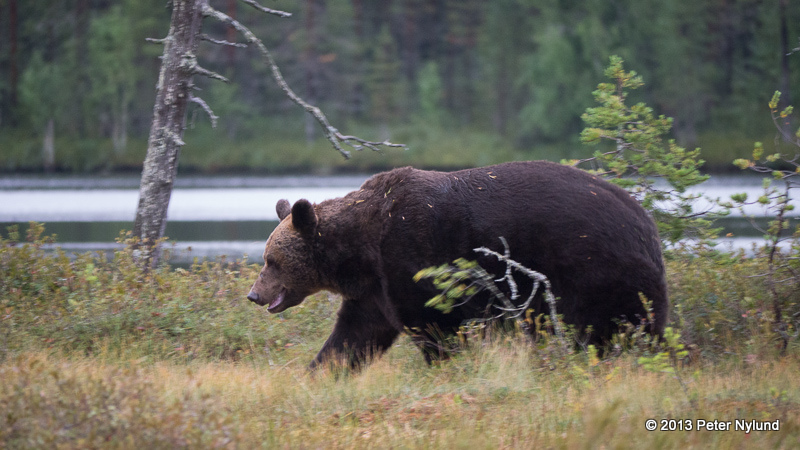 We were hoping to see bear, wolf and possibly wolverine, though there is no guarantee to see anything, since these are still wild animals coming in from Russia to see if there is anything edible offered. 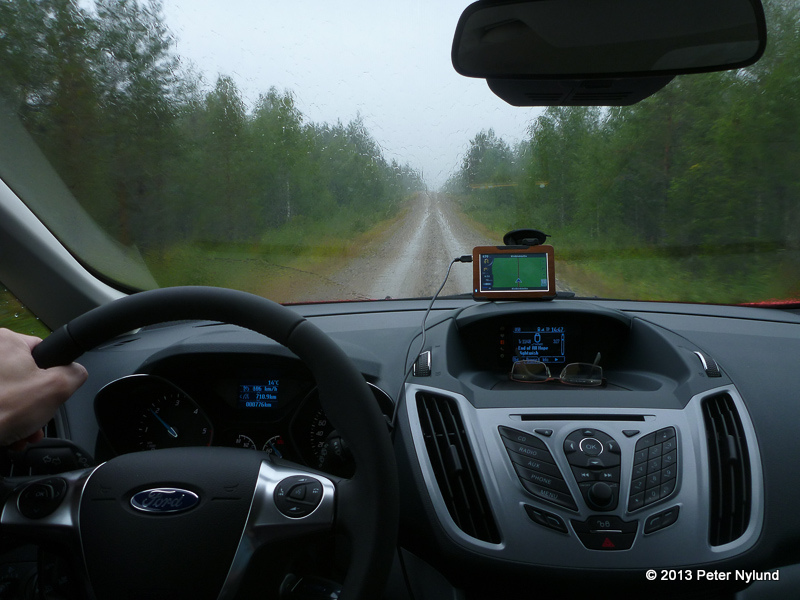 We started from Turku at 06:00 a Friday morning and had 720 km of car driving to the basecamp 60 km east of Kuhmo. 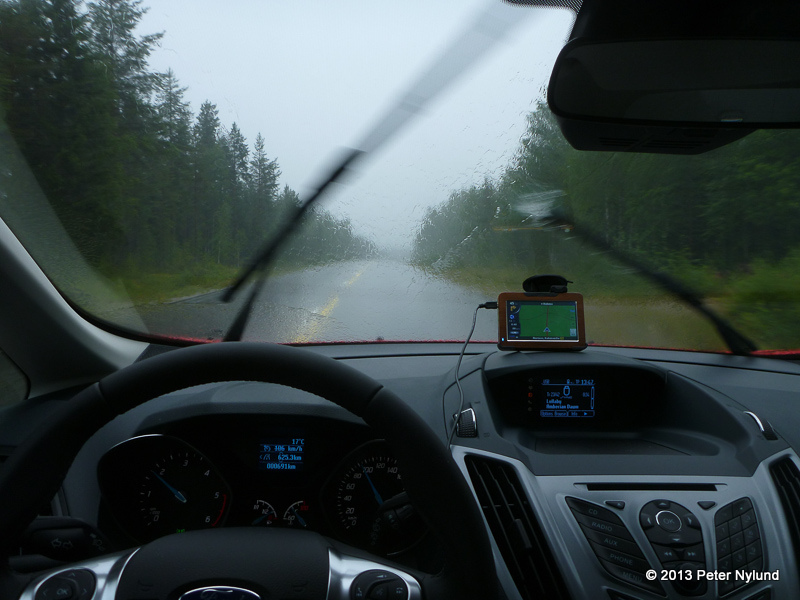 The journey felt rather long, and the weather wasn't promising. 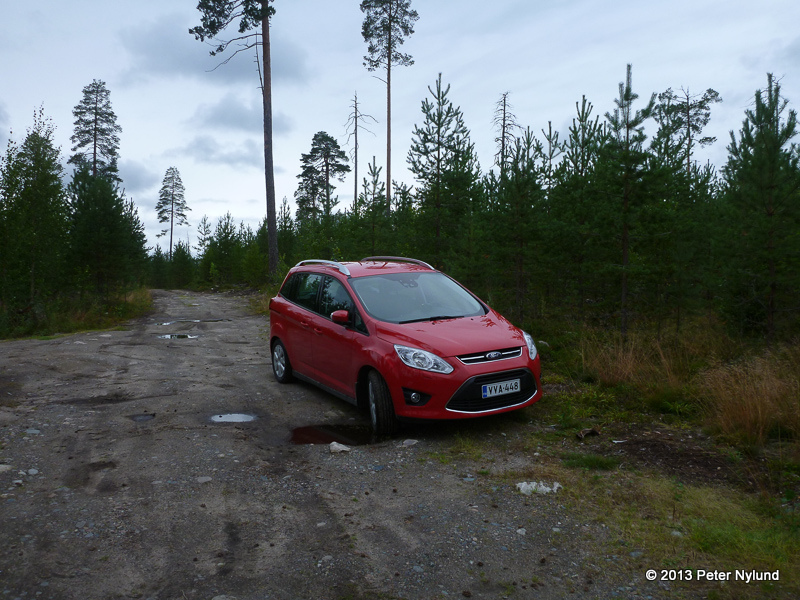 The final 15 km on rather small roads. 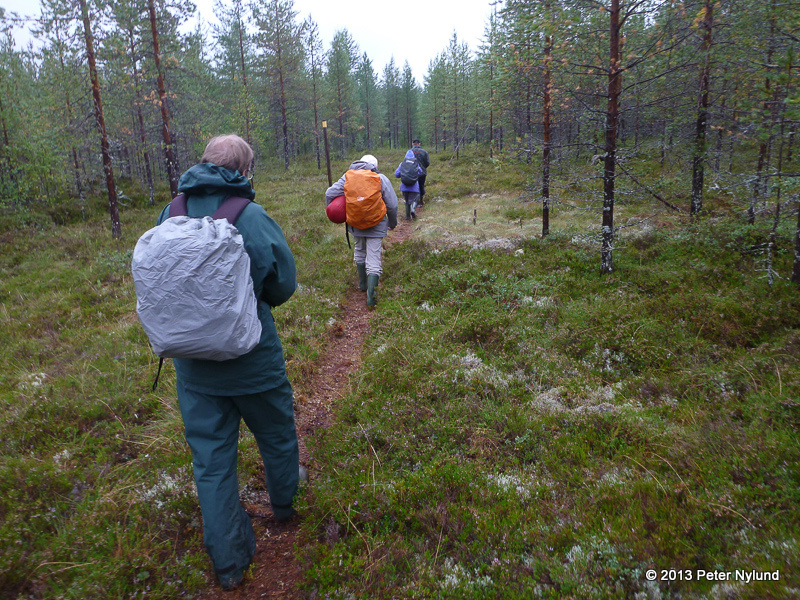 In addition to the six of us from Turku, there was an older Scottish couple, a German couple and a larger (6-8 people) group of nature photographers from Sweden there. The food at the base camp was excellent. After eating we made a few sandwhiches for the night and filled our thermos bottles and then we drove some 10-15 km on small forest roads. 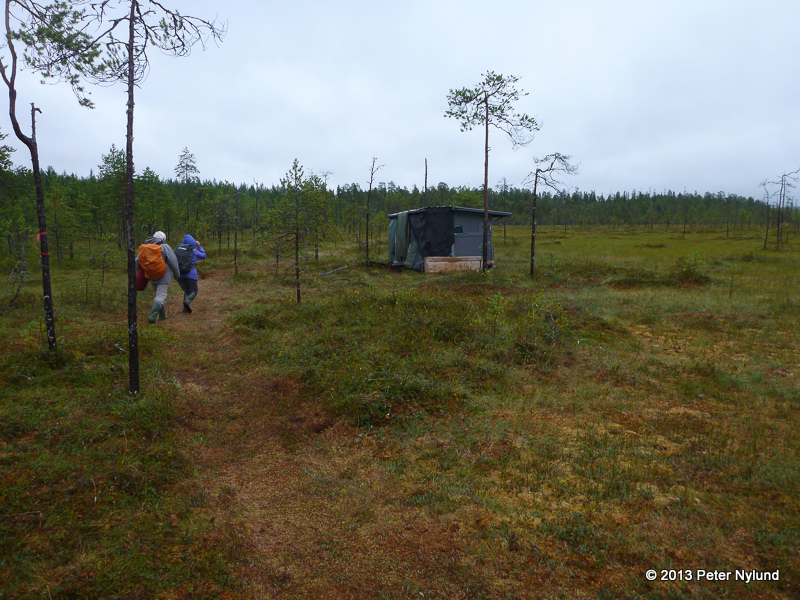 After that it was a 1 km walk to the hides. 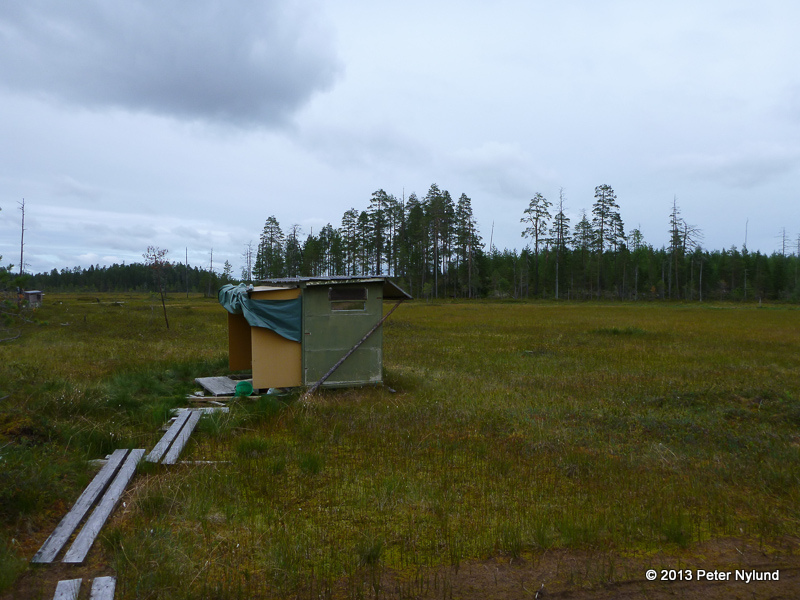 There were three hides taking two persons each at this location, one of five. The hides were rather primitive according to the Scottish couple (they had obviously expected something more luxurious) and we were not to leave them until eight in the following morning, after having entered them a little after five in the afternoon. There was a bucket of some kind in case of emergency and a canister to pee in. For the next two and a half hour not much happened. 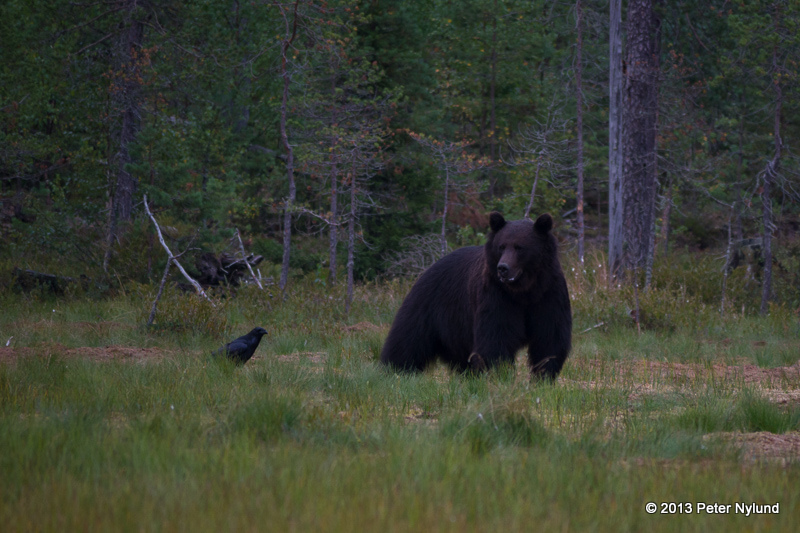 Gulls, Hooded Crows and Ravens arrived and provided some entertainment when they tried to get the salmons hidden to lure the bears there. 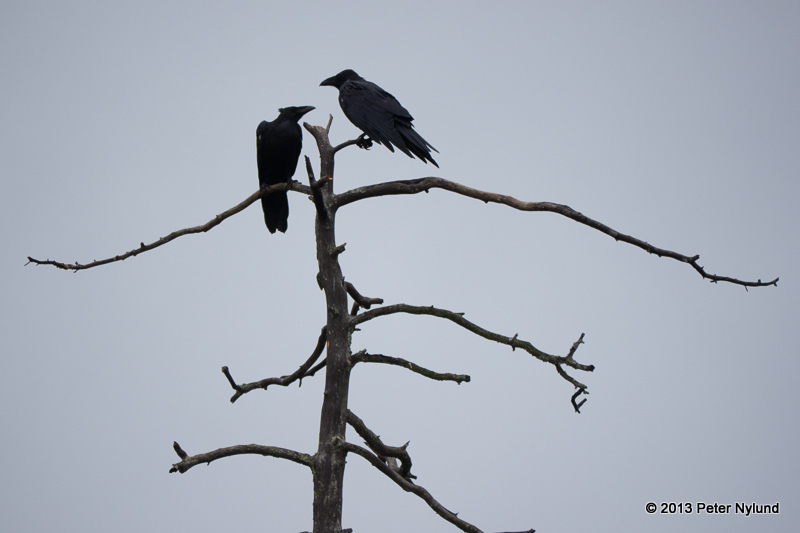 The Raven is actually a very interesting bird. 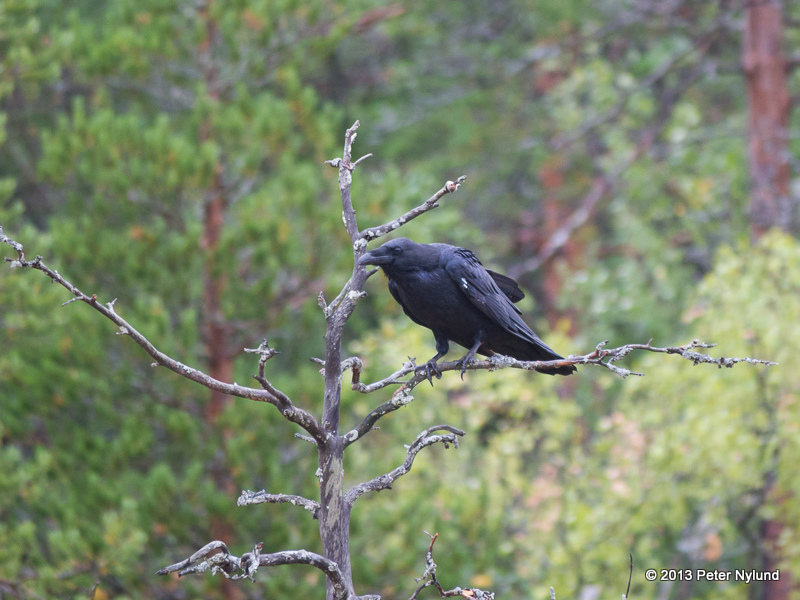 It has a totally different elegance than the Hooded Crow, both in appearance and in its flying skills. And it has the ability to generate most interesting sounds. At eight in the evening it started to happen. A very big and old scarred bear appeared. It moved slowly and looked like a giant fat teddy bear. 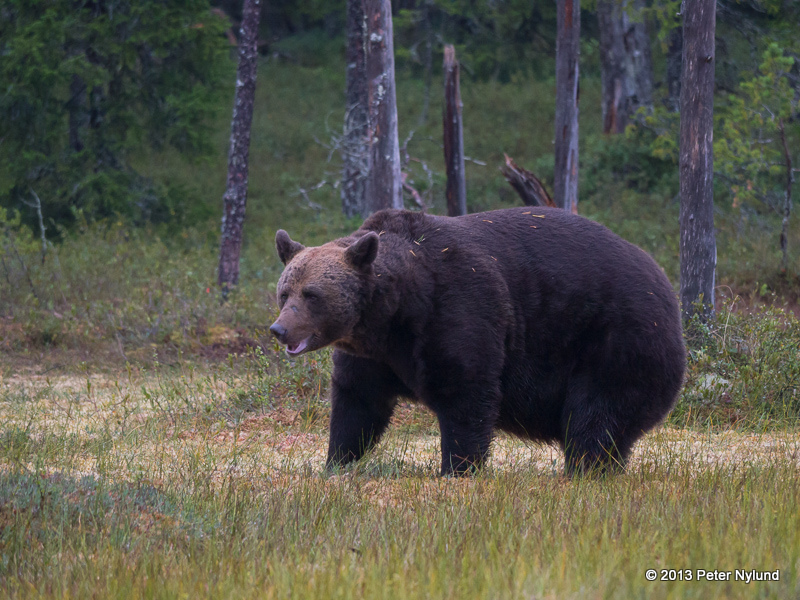 Lassi calls this bear Lenkka and said that it is 25 years old. 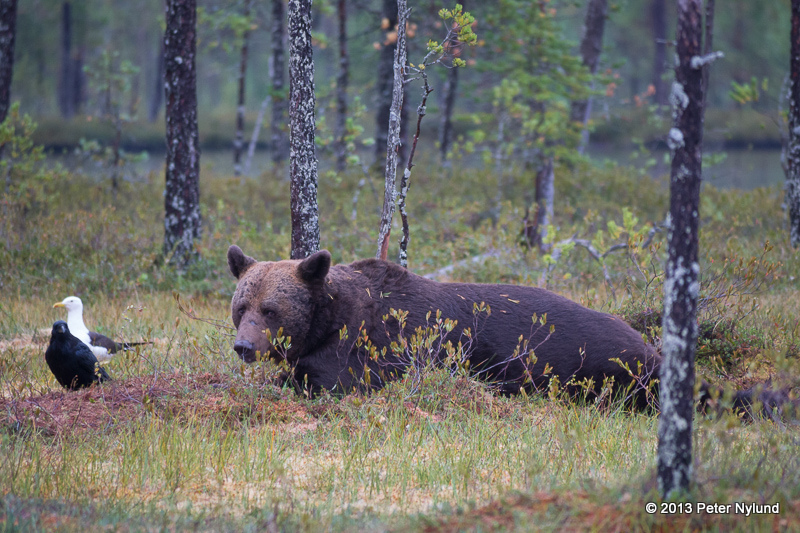 Lenkka knew where to find the salmon and promply lay down and started eating. 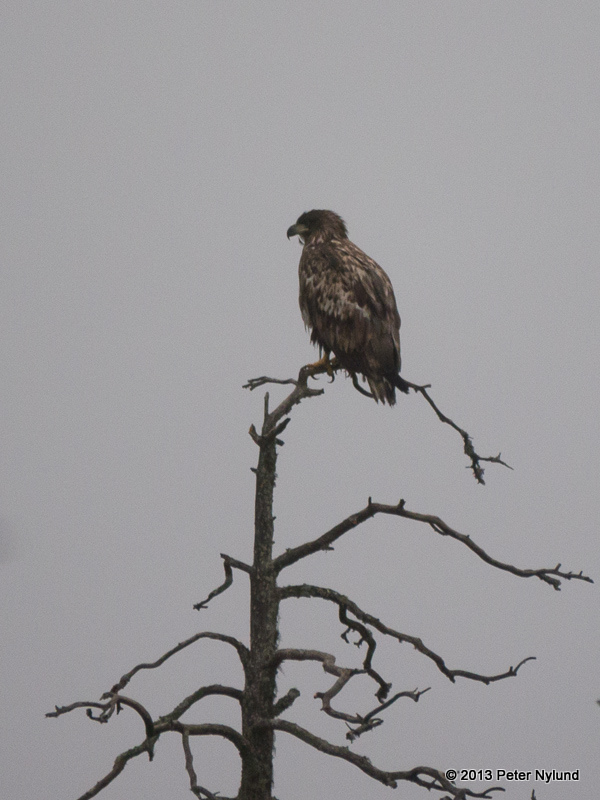 There were three white-tailed Eagles in the area and one of them came a little closer, though they all seemed very cautious. After some time Lenkka decided to move a little. He soon found another spot. 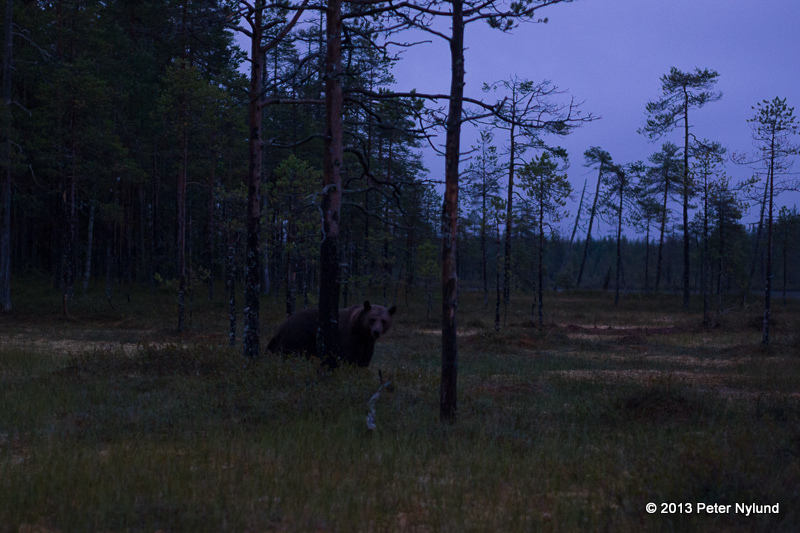 At 21:15 another bear appeared. 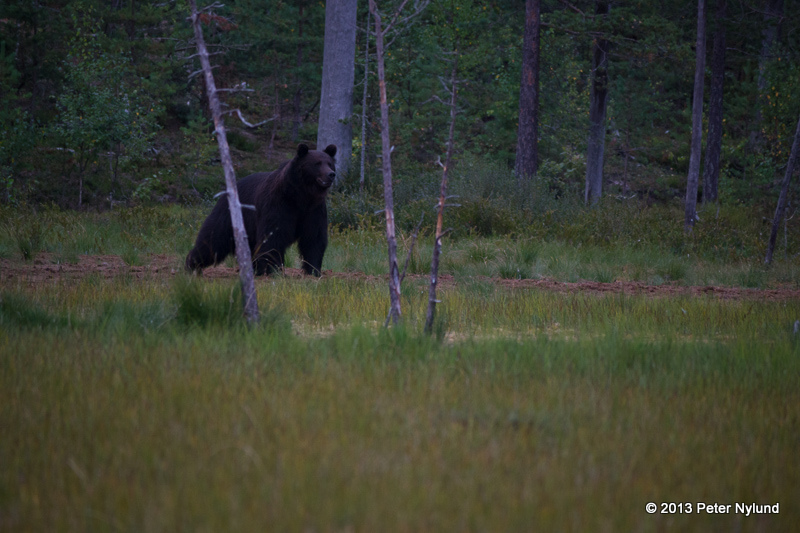 This was a young and smaller one, which moved very quickly and kept its distance to Lenkka. The bears know their place in their hierarchy. 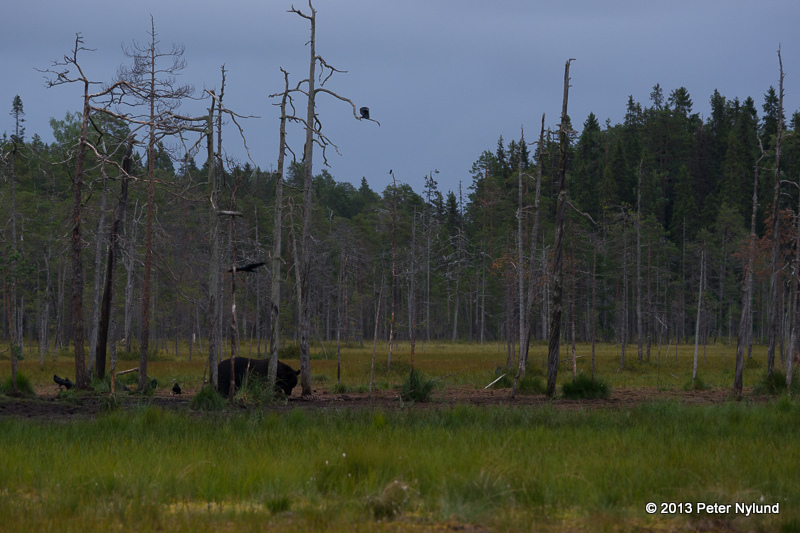 This bear stayed for maybe 10-15 minutes, while Lenkka still rested. 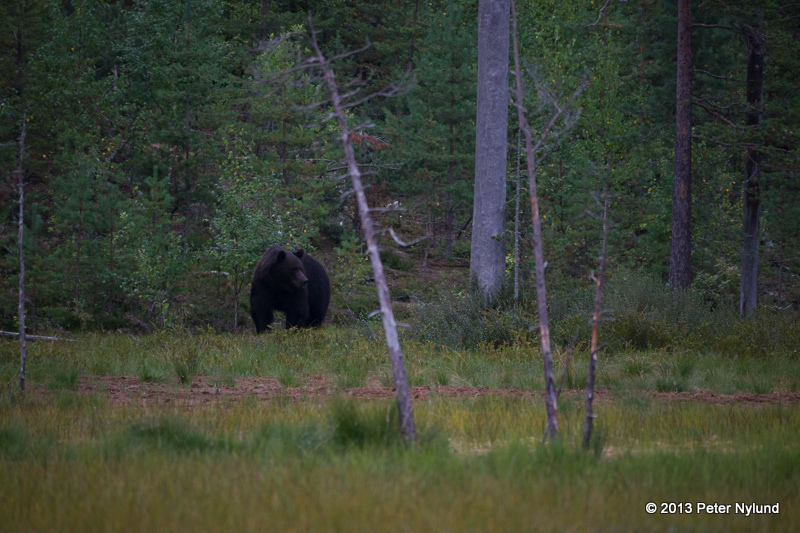 Around 21:30 Lenkka also moved on, but a third bear came twenty minutes later. It also stayed only a short while, even though it was alone. 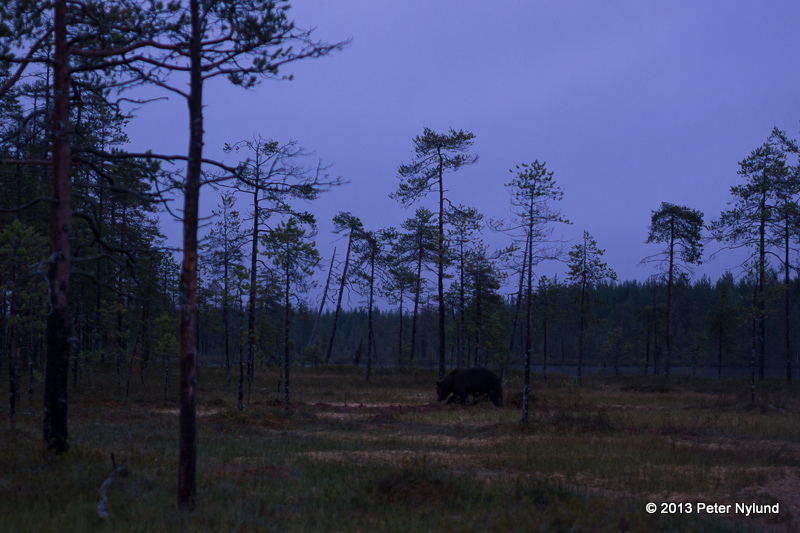 It now started to get dark, but we saw one last bear appearing at 22:15. 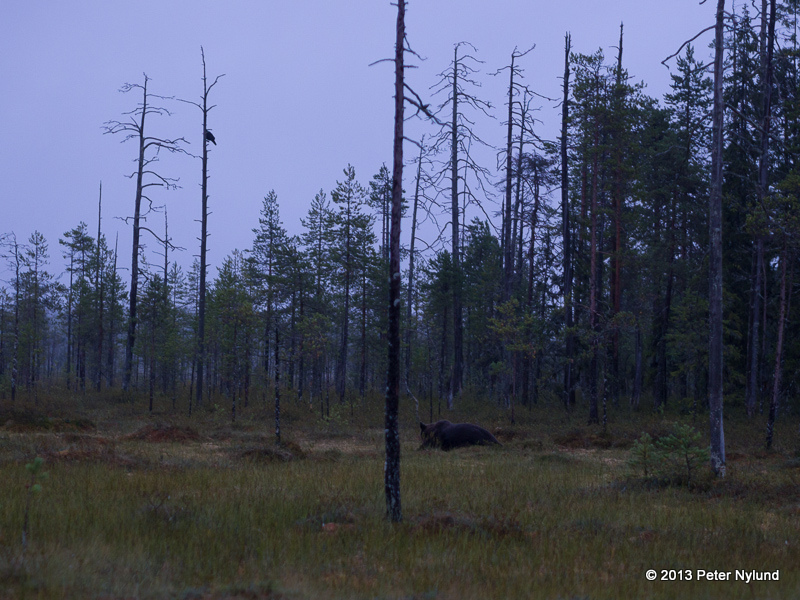 This one was easy to recognize, like Lenkka, and we would see it the following evening. The cloudy weather meant that it became dark an hour earlier than in clear weather and sometime after eleven it became too dark for us to see anything. The hide was just big enough to sleep the two of us. 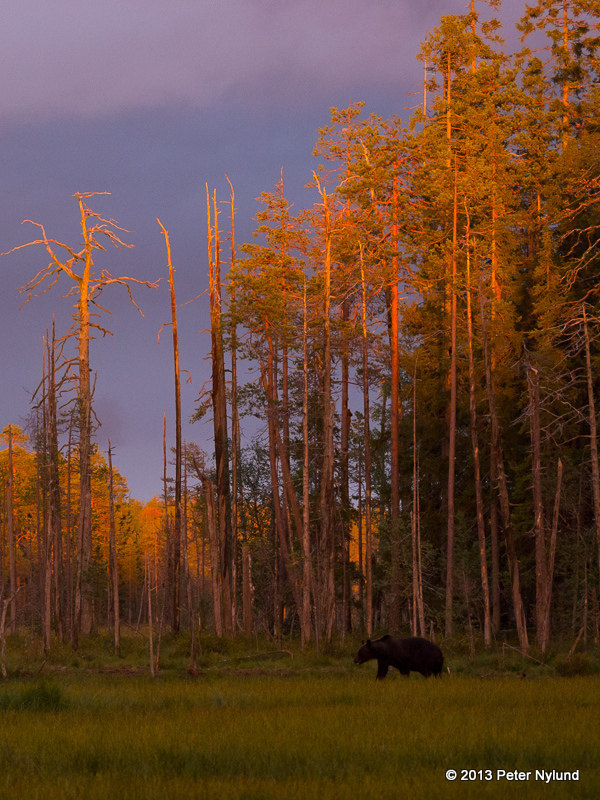 Sometime after midnight I woke up to the sound of moose (or elk if you wish, Alces alces) bellowing, a very lamenting sound. I fell asleep again, and slept a little too well, getting up again around 5:30 in the morning. It rained quite a bit, but I still had coffee left in the thermos. Nothing happened during the morning and after a little more than two hours and four three cups of coffee we started packing our gear to return to the basecamp with the cars. 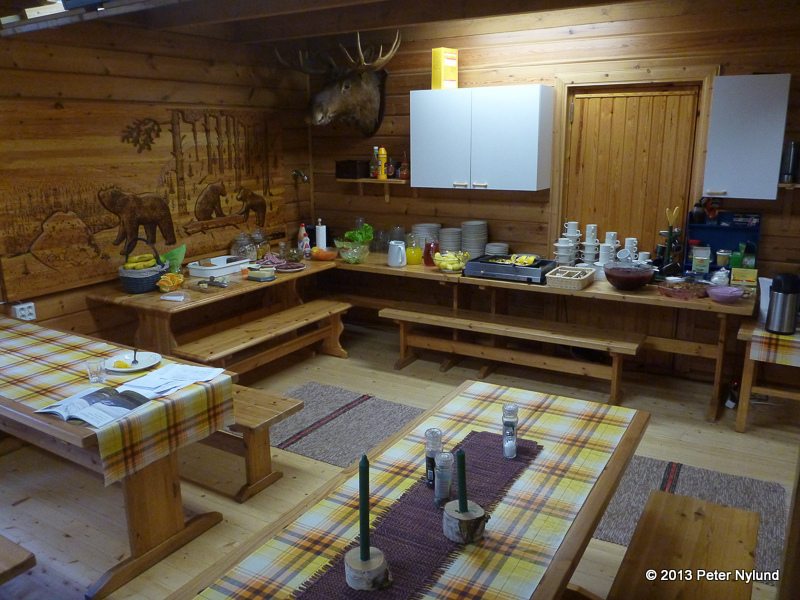 A most excellent breakfast waited at the base camp along with even more coffee. After the breakfast Lassi held a slideshow with inspiring photos. 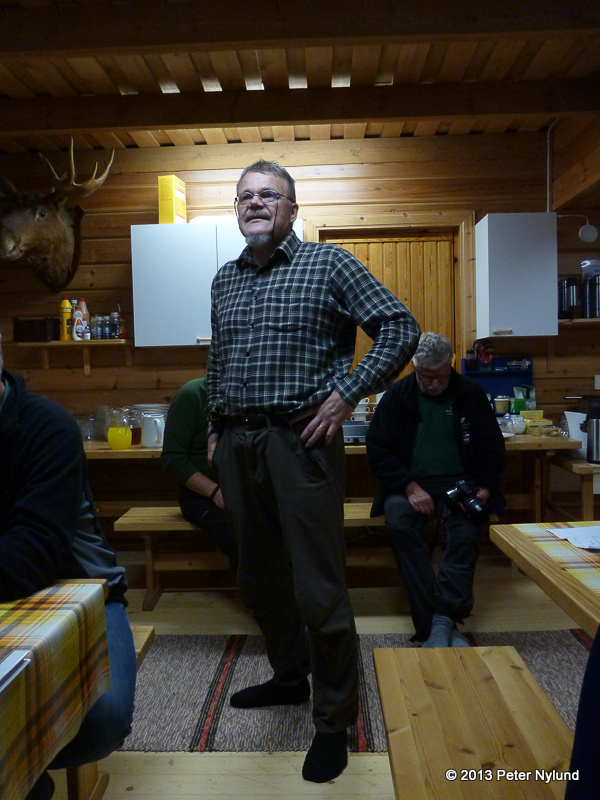 Lassi is a humorous guy and unlike most Finns, he spoke passable English, Swedish and German with his guests. The rest of the day was spent resting until the dinner at four in the afternoon, as well as a stroll around the area. 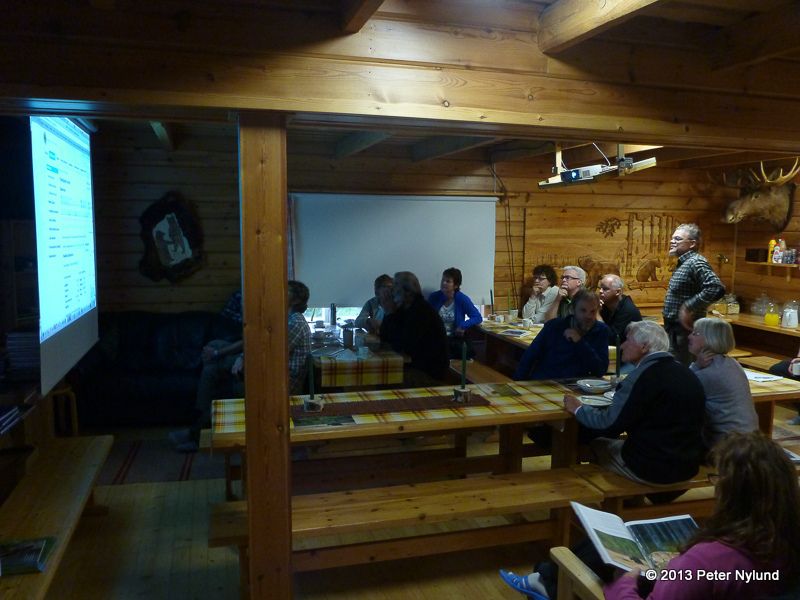 For dinner we had the best Karelian stew I've ever tasted. 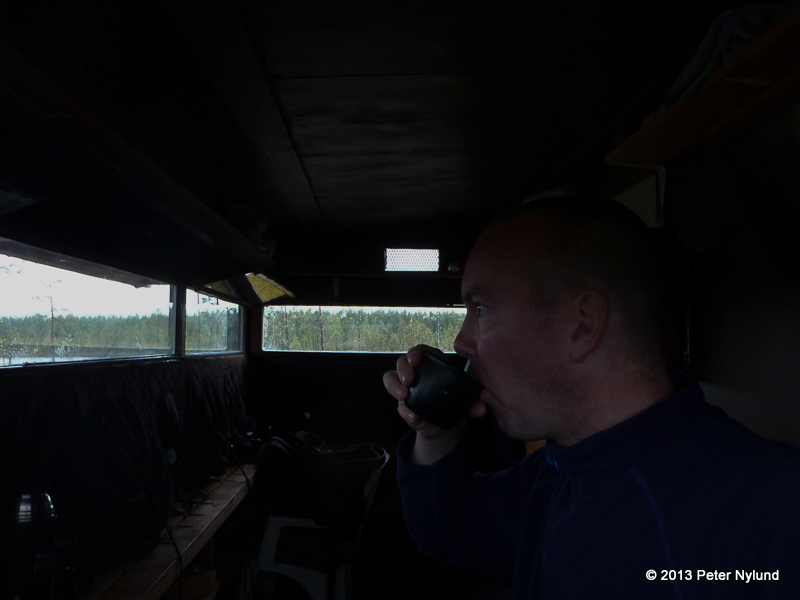 After dinner we again went to the hides and were in place around half past five. 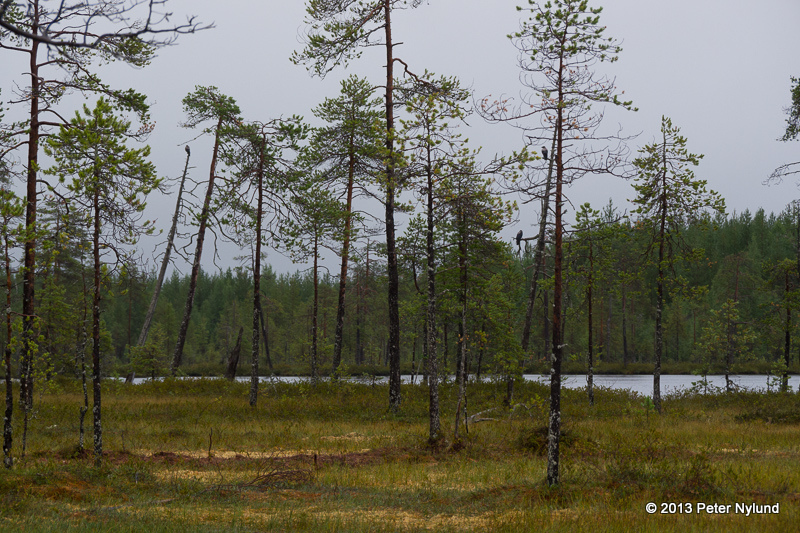 These hides were at a different place, about 500 m from the previous ones, and the four hides took a total of nine persons. I again was in a two person hide with R.
Then we waited. The sky wasn't uniformly grey. 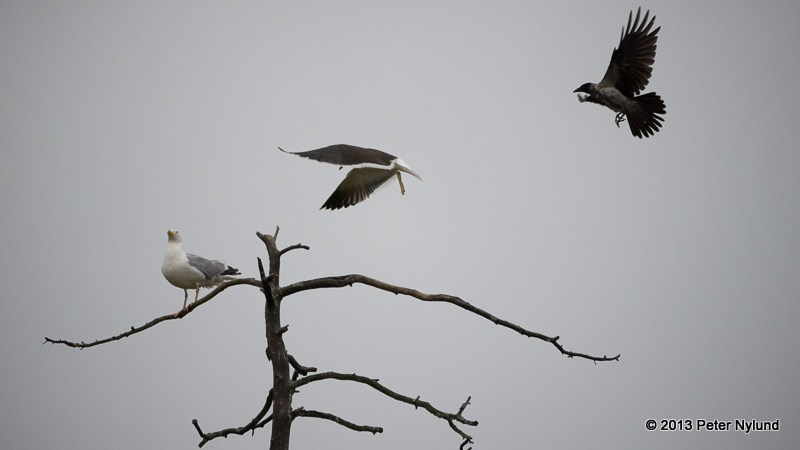 There was at least some different shades of grey, but it was still not particularly light. We waited patiently, though I started on my coffee earlier this time. 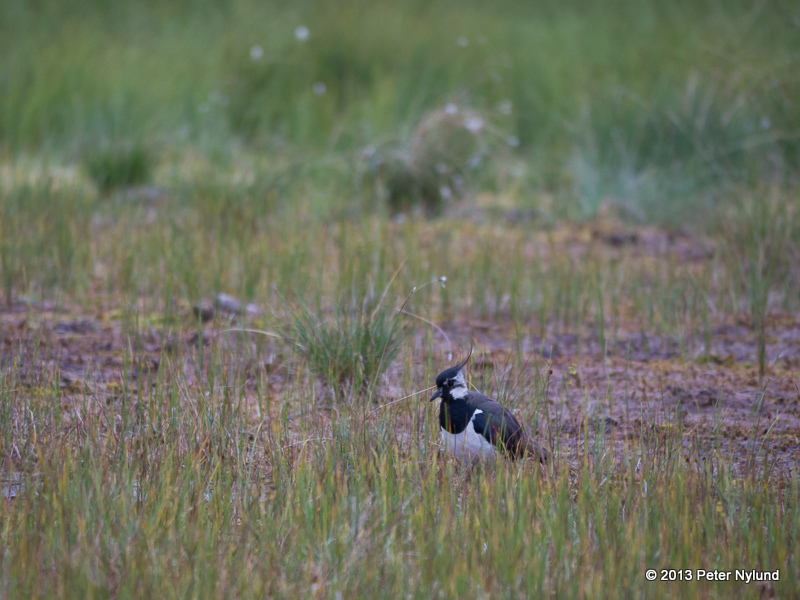 A Northern Lapwing posed for us for a while. 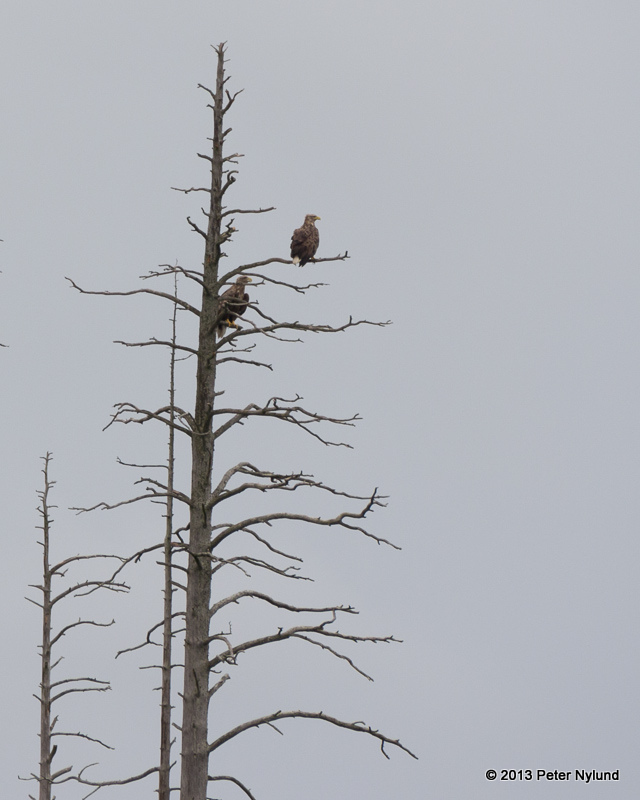 The White-tailed Eagles also made their appearance. 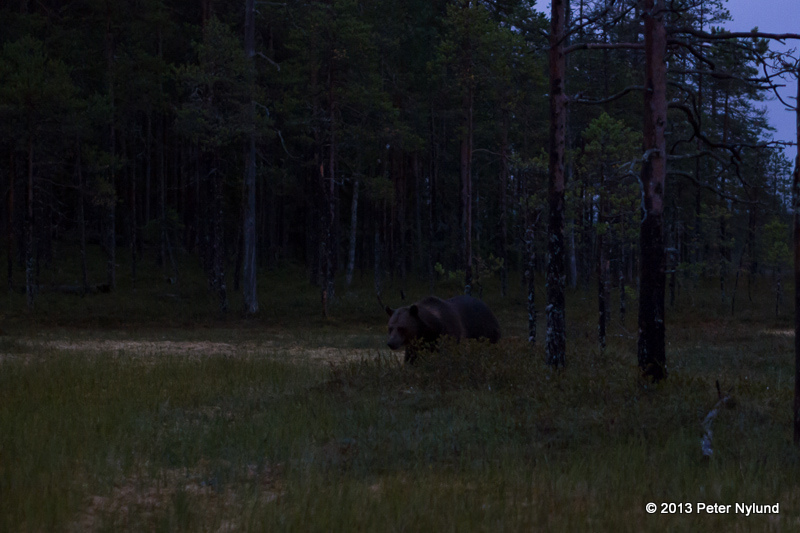 At 19:45 I saw the first bear in the distance. 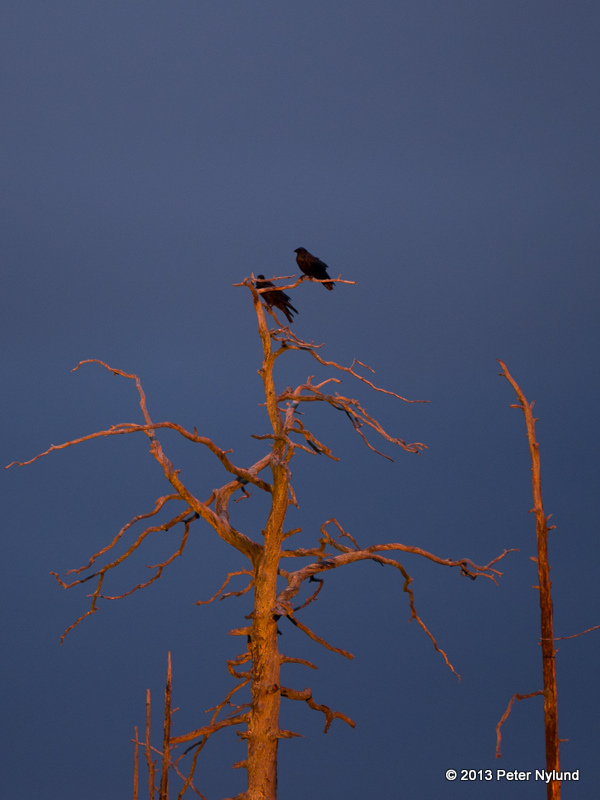 It disappeared, but twenty minutes later something black moved in the forest on the other side of the mire. 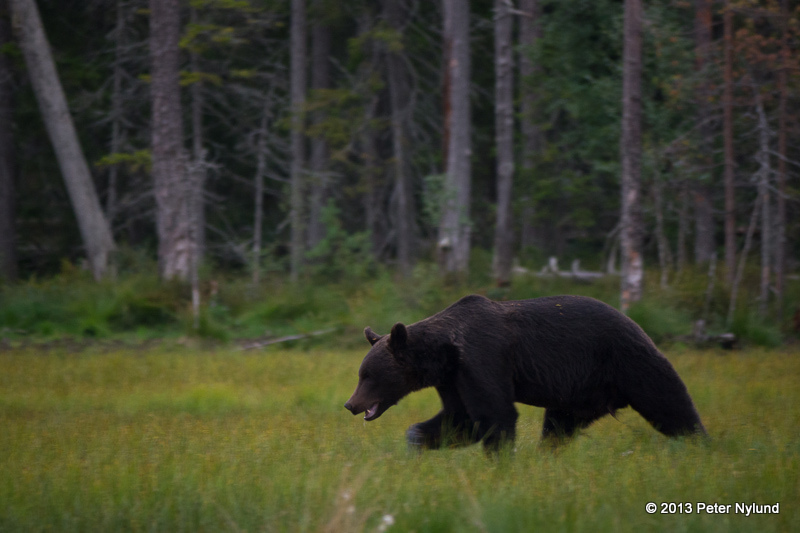 The bear seemed to be very cautious, probably because of another bear we didn't see. After a while it finally dared to leave the forest. It arrived at the place where a dead pig (I think) had been left earlier, though there was not much left of it. I think this bear was bear number three from the day before. A while later another bear appeared. 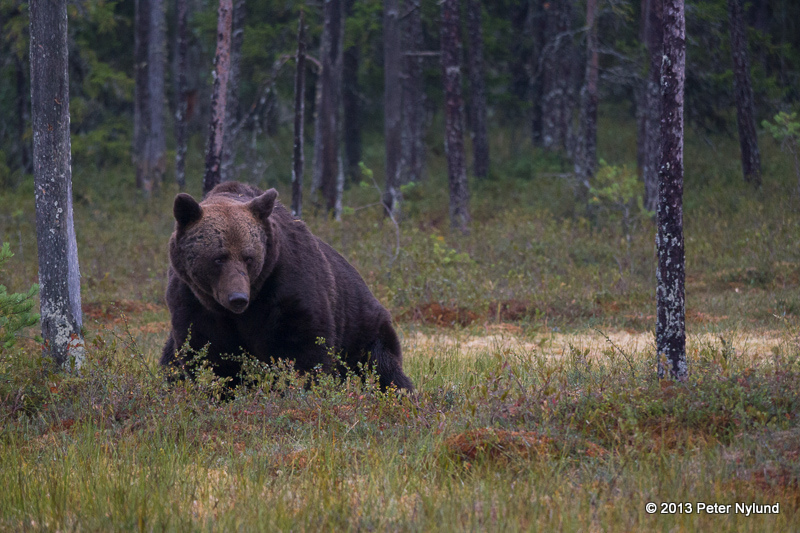 This was a younger one and it's thinner appearance, cautiousness and quick moves showed this to be bear number two from the day before. Bear number four of the day before, easily recognizable by the white spot at the neck, proved to be the boss at this place. 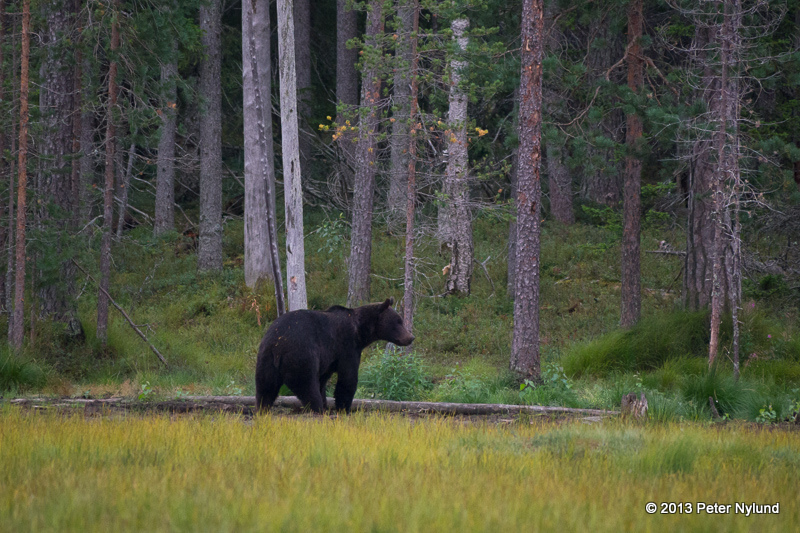 It just walked straight while the other two bears stood still or kept their distance. 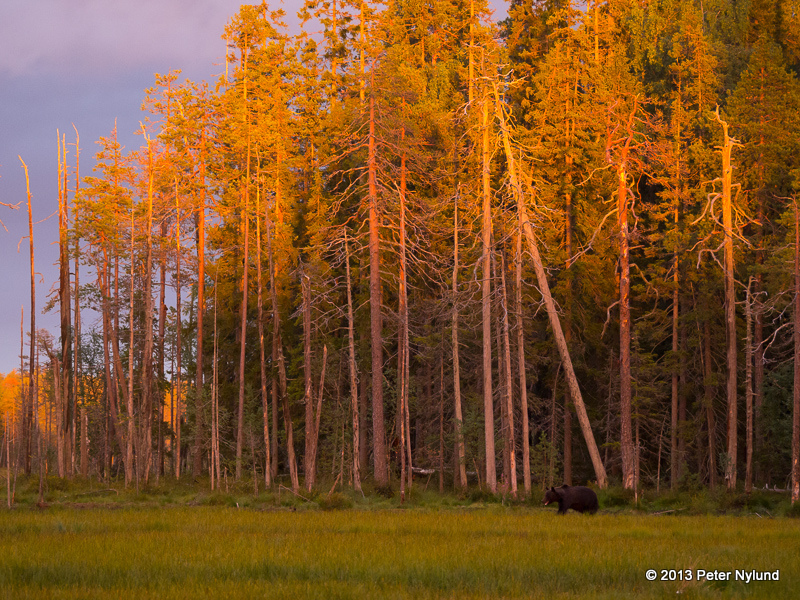 The bears stayed in the vicinity until around nine in the evening. 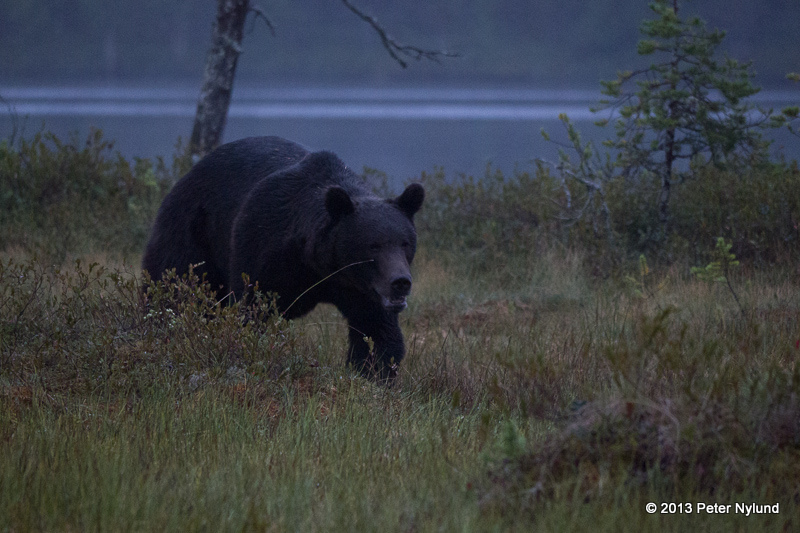 Some 10-15 minutes after the bears left, the dull greyness gave way to a more dramatic light. After a while one of the bears actually returned. The bear still found something to eat there and stayed for a while. 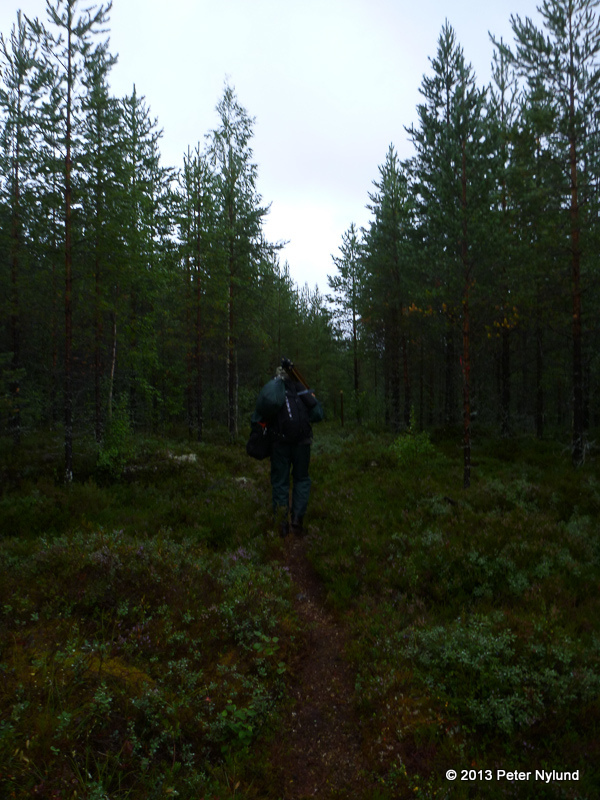 Soon the cloud cover returned, it became dark and we went to sleep. 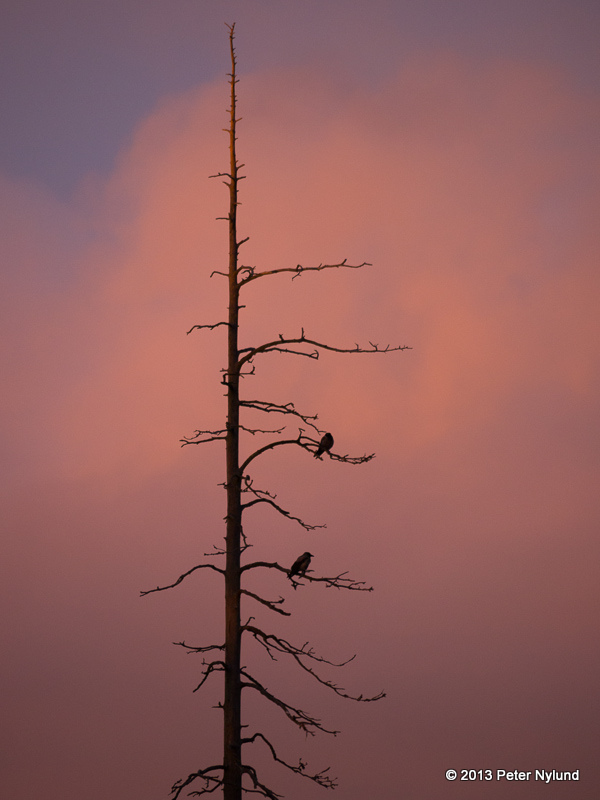 I got up a little over four in the morning to see if the wolves would appear. A pack of wolves had visited a few days before. 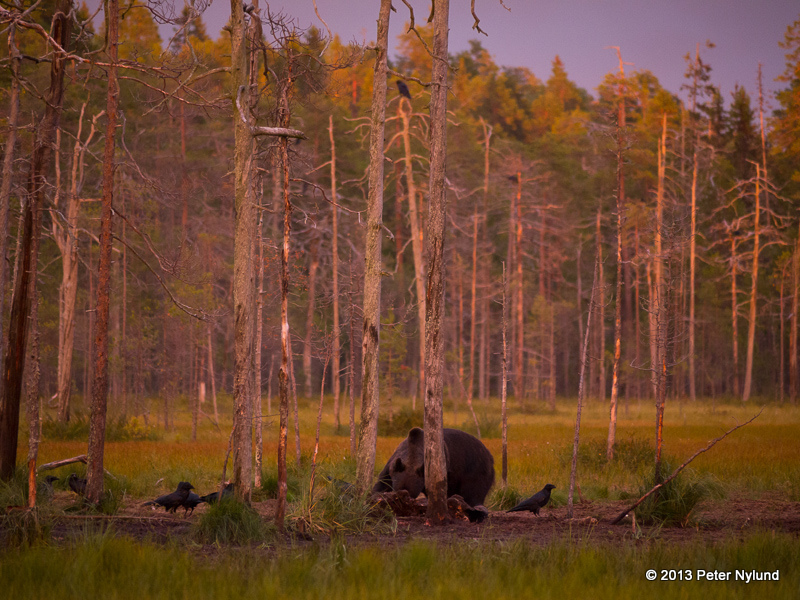 During the night some of the Swedes also had a wolverine appear before their hides. When nothing happened I went to sleep again a little over six in the morning, and got up again around eight. We then returned to the base camp for breakfast. 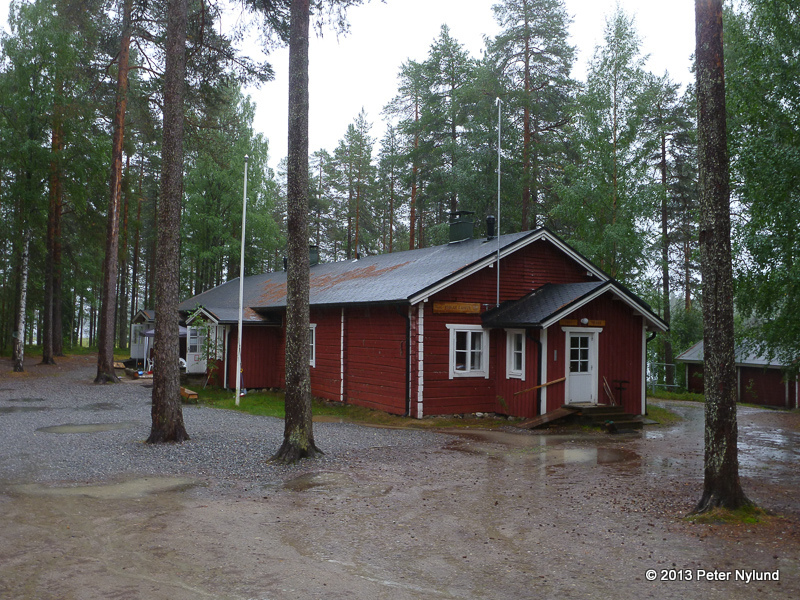 I think this was a very nice experience and I also think Lassi Rautiainen provided a good nature package. I'm sure I will be back at some point. 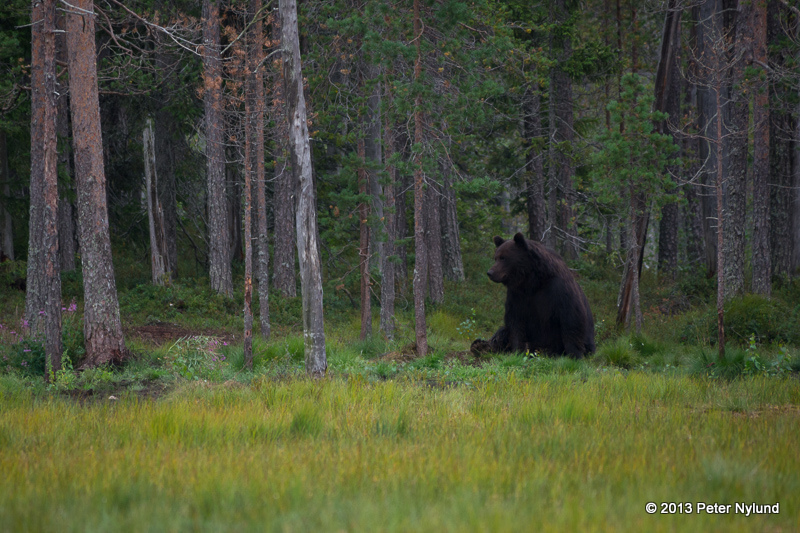 I would of course still like to see a bear (and wolves) on my own in the nature, but it is not likely to happen. 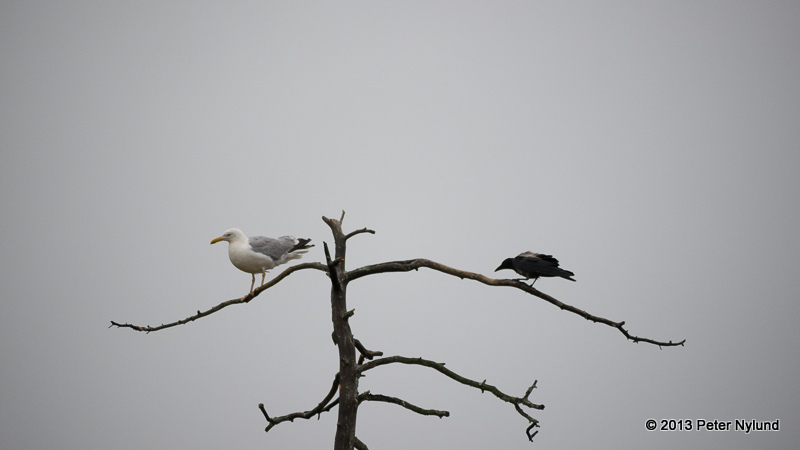 Both animals are too wary of humans for that, mostly because of hunting I reckon. 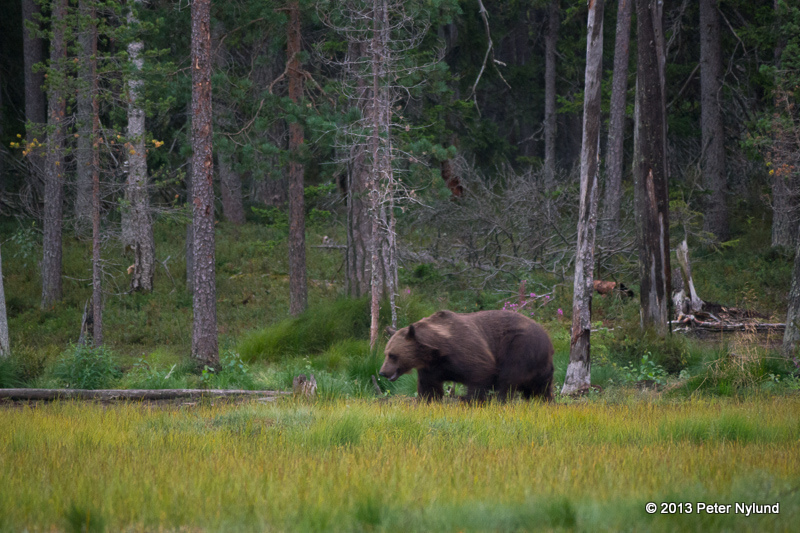 To see the animals on your own would demand a lot of time in the nature or going to a place like Rovdjurstorget (the Predator Square) in Sarek and spend a day or two with the binoculars.